Wouldn’t it be great to cash out … sell the large family house and then purchase a small home with an ample yard? We could grow plenty of food for the two of us and slowly move into semi-retirement. That was the plan … and at 48 yrs. old our lives made a definite transitional turn. We’ve moved on from the hustle and bustle of raising three wonderful children in a large city house, to downsizing, in a small town. The 2 bedroom rancher that we purchased, for a reduced price, required lots of TLC. It had been abused by renters and neglected by owners for the past several years. Regardless of its state, something called me here. I felt a connection to this home the minute I walked into it, inspite of the orange stucco covered walls and 1970’s olive green lino floor. I can’t really explain why, or what, attracted me, but I immediately knew that I had found what I was looking for. We moved in during a cold Febuary storm. The house was dark, damp and not exactly welcoming. The furnace rattled and roared in the crawl space without producing much heat, however, we started to make this place our home. Firstly, a tiny wood stove was installed, where we curled up to design changes, as the snow fell outside. 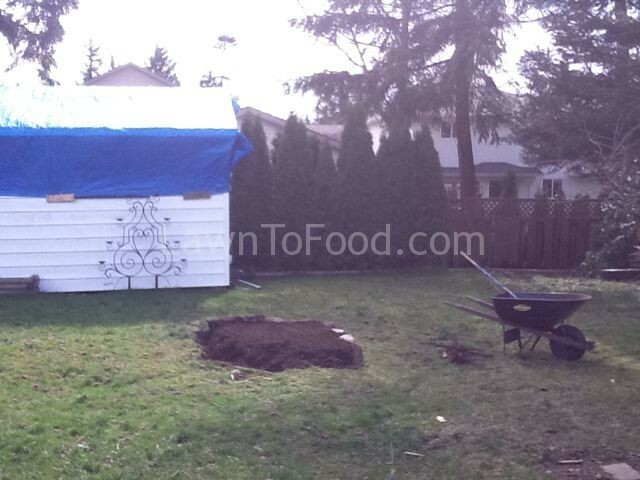 By March, the birds were chirping and I was getting anxious to dig up a garden. I ventured out to the backyard to rake up piles of leaves left on the lawn. I was very surprised to find crocuses and daffodils poking through the sod. On further inspection, I found all kinds of bulbs and shrubs around the yard that were buried under debris. 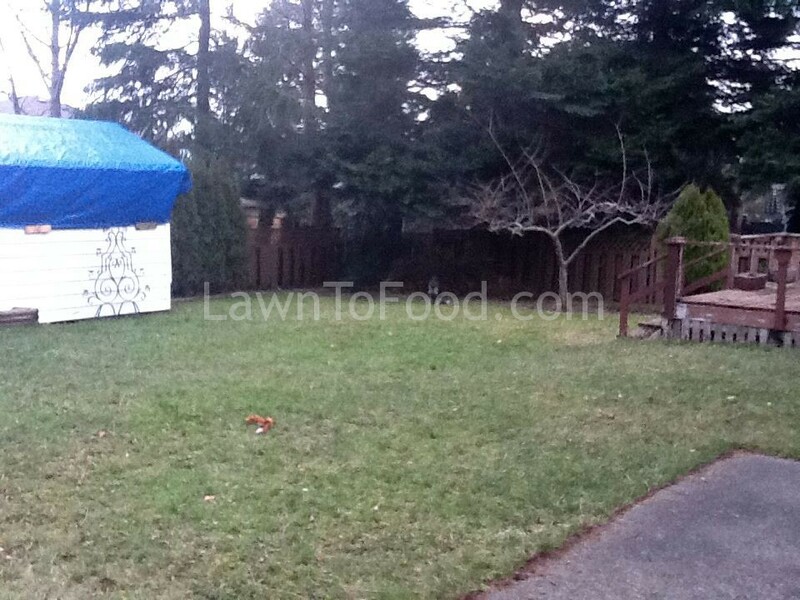 It made sense now, someone, at sometime, had definitely loved this yard. This little house once was someone’s pride and joy, and that’s why I feel so comfortable here. The backyard in March 2012. Left ~ the leaking roof on the workshop is covered in a blue tarp. Right ~ the kitchen porch is rotten with dangerous holes that you could fall through. The left side of the workshop with our dog, Buddy. During March, my husband had to a great distance commute to work. I spent long days at home alone, working on the renovation projects. The carpets were ripped up and the drywall ripped down. When I needed a break from the dust, I headed outside for a change of pace and some fresh ocean air. 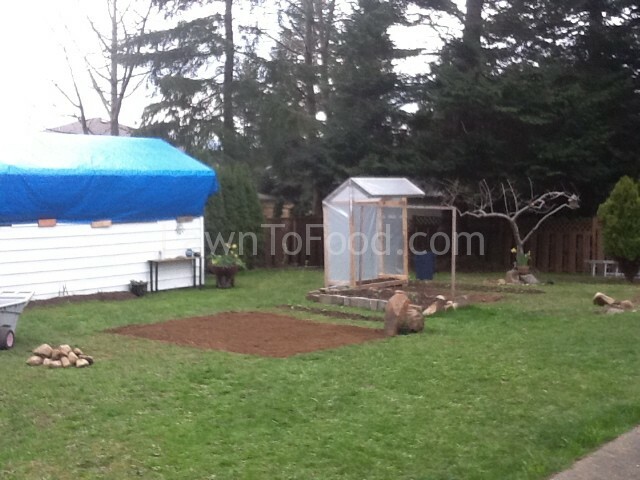 Everyday that wasn’t pouring with rain, I spent at least an hour in the backyard turning lawn into vegetable beds. This is the first vegetable bed that I started to dig. I found rocks and bricks around the yard to use for retaining the soil. The second bed that I dug, became the raspberry row. I think I started with 7 canes from a neighbour. With a few 2×4’s I built a tomato shelter to protect them from rain causing blight. Tomato blight is a fungal disease that settles on wet foliage, then infects all the plant’s tissues, ruining the tomato crop. 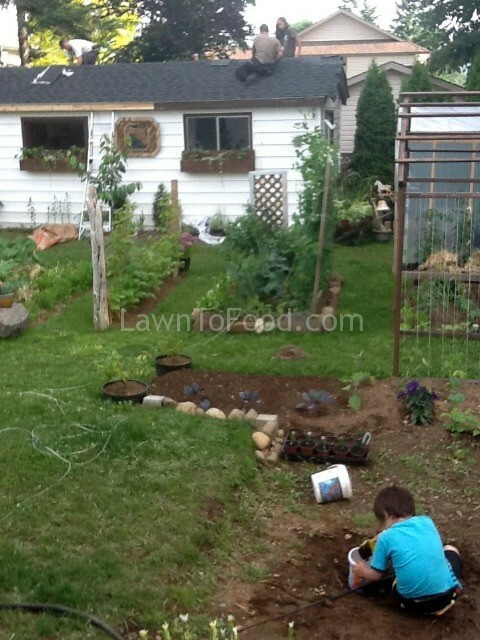 It really was amazing how fast the garden evolved with only a few hours a week of digging. 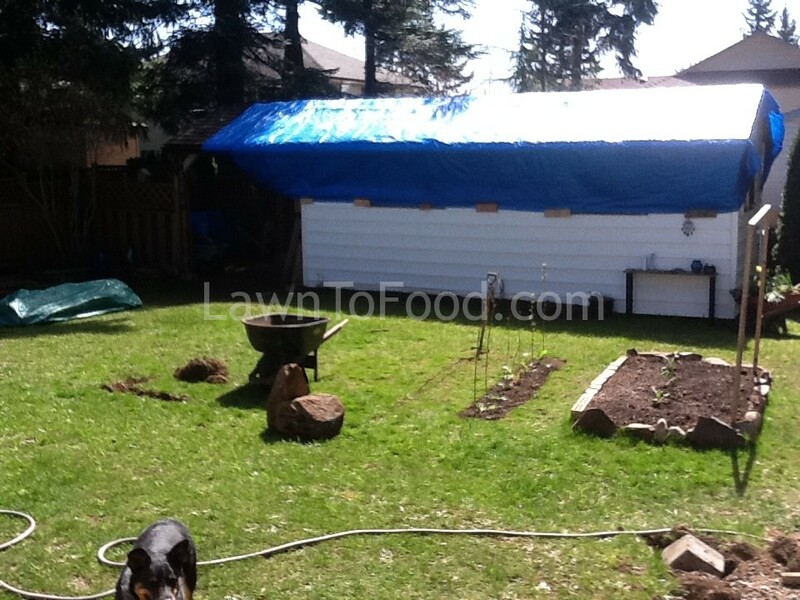 Before I knew it, the majority of the back yard was ready for planting !! 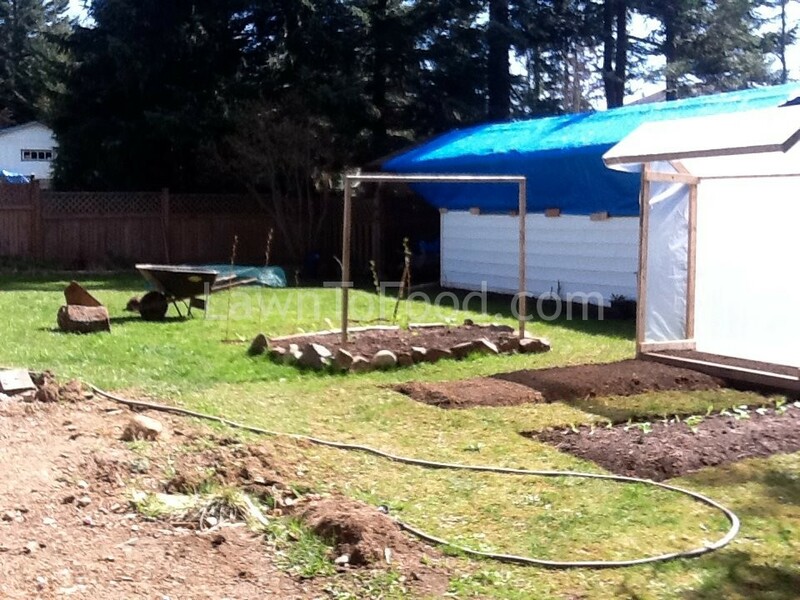 Two more beds to the right plus a tomato house. It’s getting into April now. 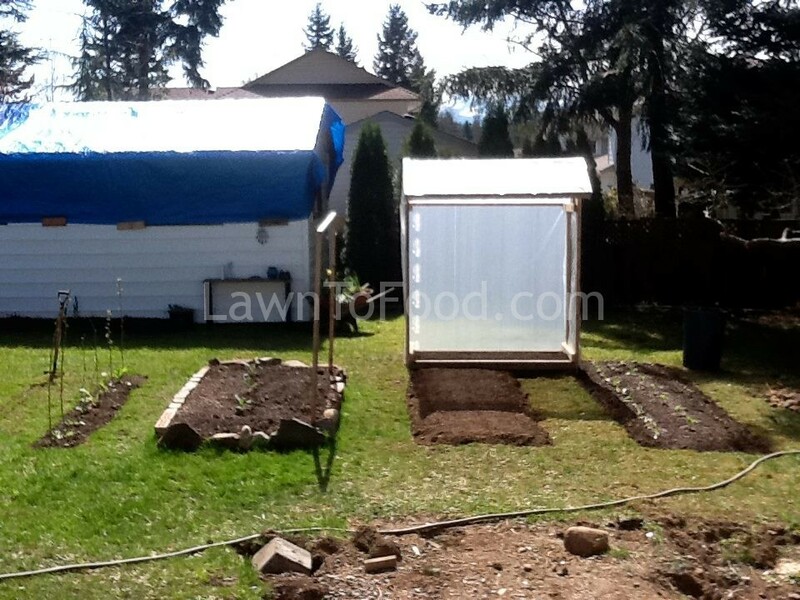 The weather is warming up and I have started to plant the cool weather crops. We added one more bed to the left of the raspberry canes. This picture is taken from the same angle as the very first one in the blog post. Only a few weeks later the soil was turning green with growth. I planted broccoli, lettuce, chard, collards, onions and radishes to start. 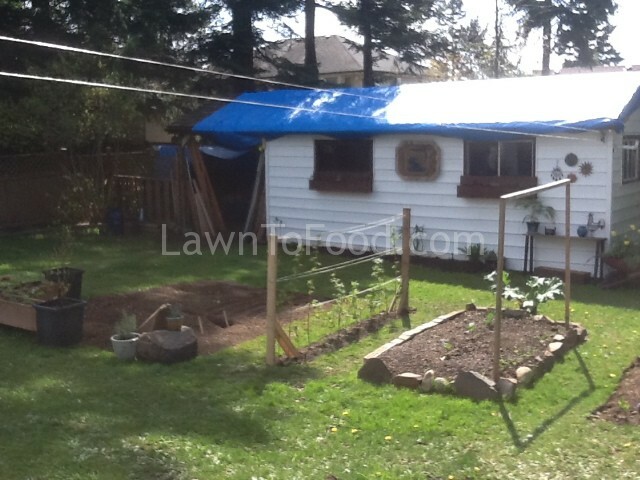 I’ve added a trellis for peas, guide wires for the raspberries and built planter boxes to grow strawberries. I purchased some blueberries and put them in the black containers. I wasn’t sure about where to plant them permanently but wanted to get some established in our yard. Our kids helped build the workshop roof and our little Brusselsprout grandson, helped me plant 2 cherry trees in whiskey barrels. 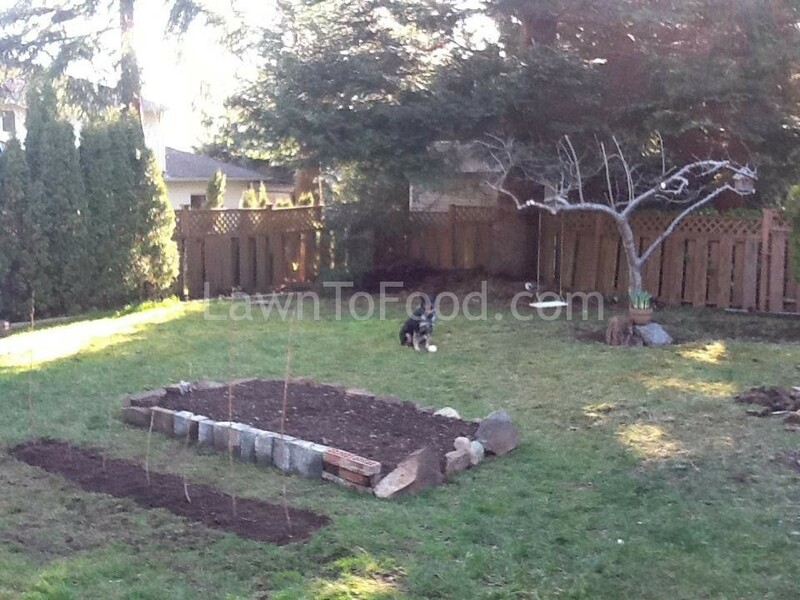 Eventually, I will plant the semi-dwarf fruit trees in the ground, after we design the patio and back deck. Carrots, potatoes, cauliflower, fava beans, tomatoes, peppers, herbs and many other edibles are all growing now. 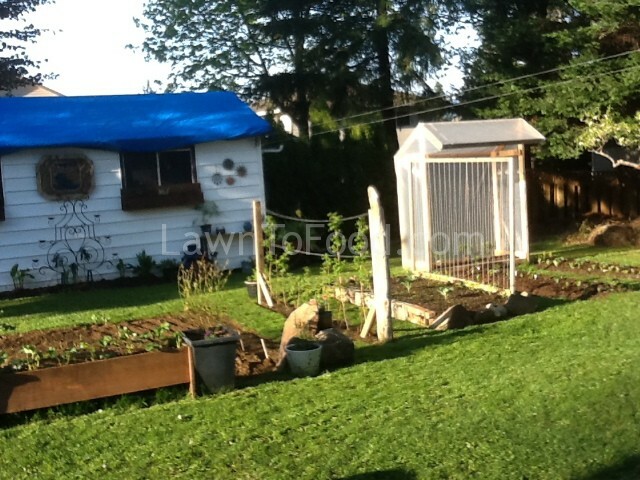 The garden is still expanding, as I added a purple cabbage patch and an arch that acted as a green bean trellis. 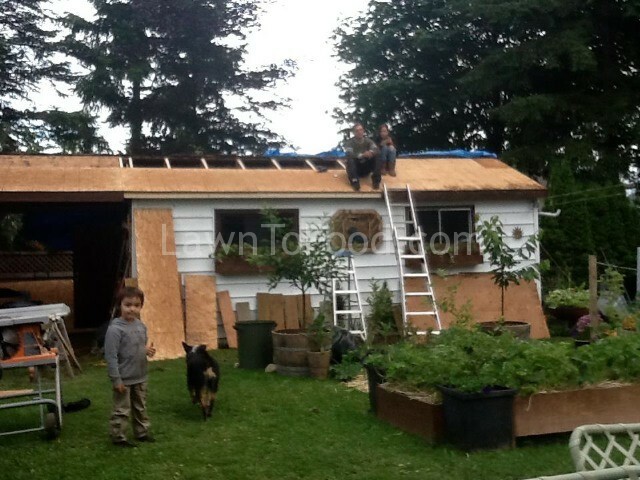 The workshop roof is almost completed and Brusselsprout is collecting worms for the compost pile. Our flower boxes contained some sugar snap peas as well as ornamentals. It is now July 2012 and we are eating from the garden everyday. Gorgeous salads and other vegetables fill our plates. 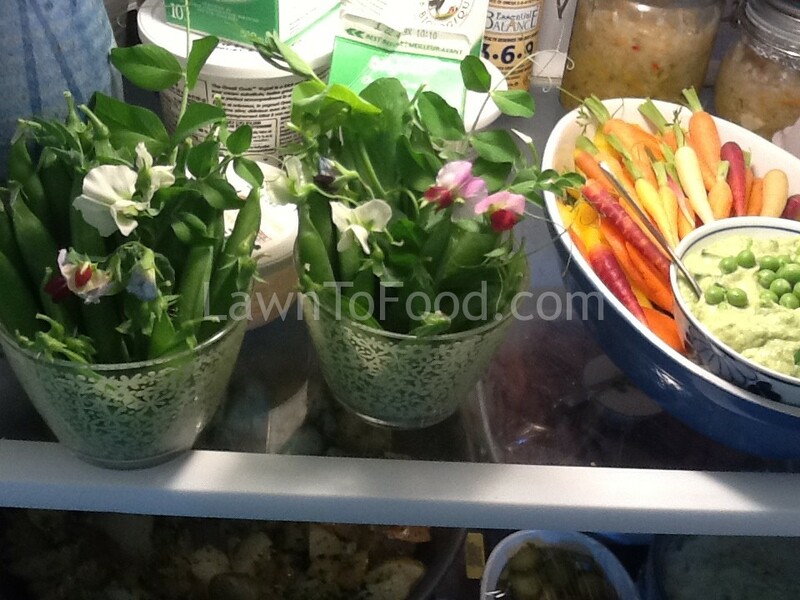 Peas, pea shoots and muli-colored carrots make a beautiful buffet display. 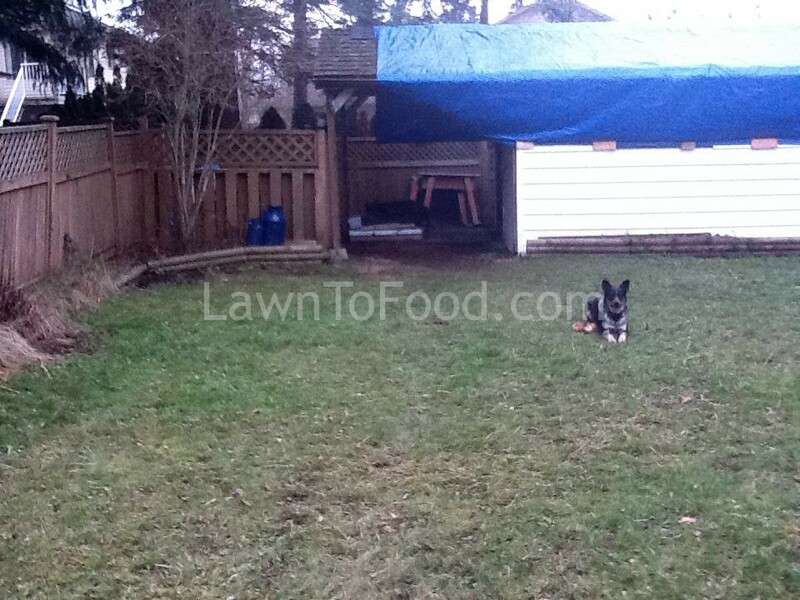 The backyard garden transformation sincerely helped make the house renovation process easier for both of us. Being able to step outside with a glass of wine, sit down at the patio table, and both eat from and gaze at the beautiful garden … that is the best form of relaxation for us. We come back our home’s interior renovation projects refreshed and rejuvenated. 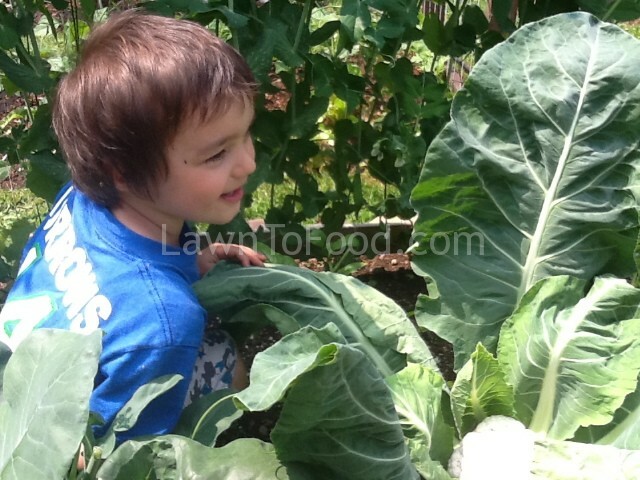 As an added benefit, our little Brusslesprout has learned where his food comes from … Grandma’s garden of course!! 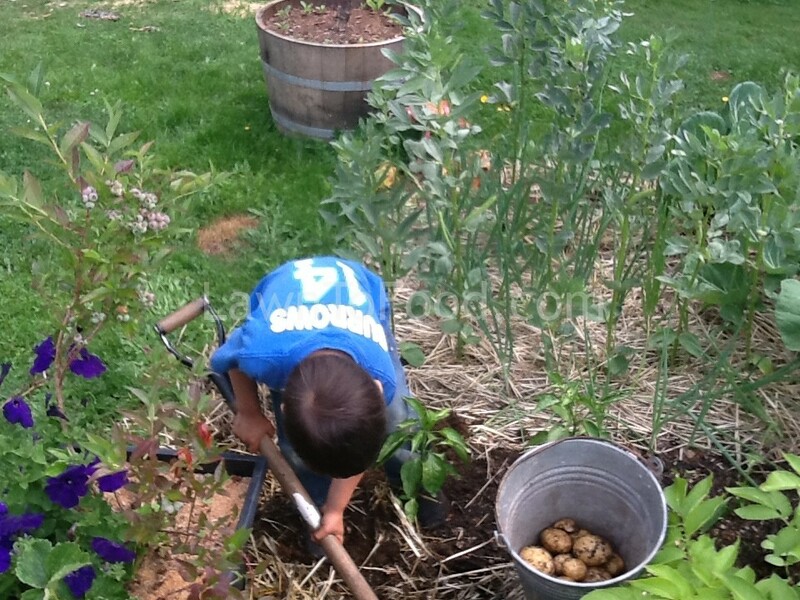 Brusselsprout is digging up his “Tatatoes”. 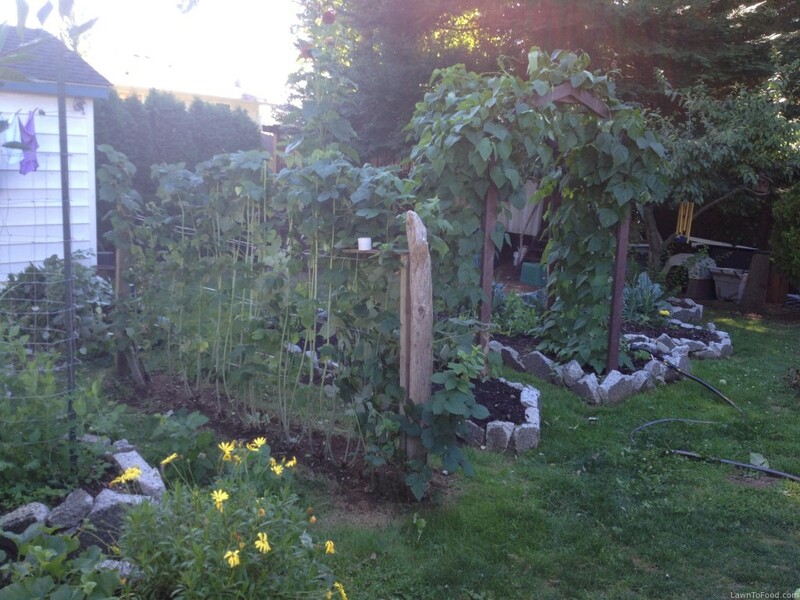 This entry was posted in Comox - Hillside Ave, Crop Planning, Growing Food, Recycle Reuse Rebuild, Yard Transformations and tagged backyard, garden, lawn to food by Lynda. Bookmark the permalink. I love what you are doing. Thanks for the photos and inspiration. Let’s transform Comox from a 3D Home Depot catalog to a beautiful diverse food rich community!